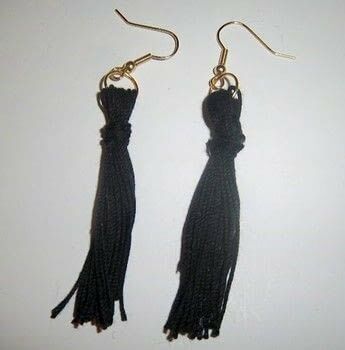 These simple tassel earring only took about 10 minutes to make and cost practically nothing to make. Sorry I don't have pictures as my photo card became corrupted, but it is very easy to make these using crochet or embroidery floss. Line thread up with the bottom of matchbox lengthwise and wrap 15 times then cut thread. Place a small dab of hot glue across the back 1/4 of an inch down to secure the threads. Push the threads off of the matchbox and on to a pencil at the top. Use a piece of thread (8 inches or more) and tie around the earrings tassel and knot in the back, tie a knot and then continue wrapping around and knotting in the back. Clip ends. Remove pencil, open jump ring and thread through the loop and the ring at the end of the ear wire and close. Cut threads at the bottom end.